Our objective is to best represent our manufacturers needs by driving business through specific distributors. 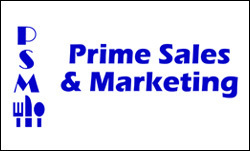 We believe in growing the business through the key operators in the market – this is Prime Sales & Marketing’s strength. Each distributor is assigned an individual PSM account executive to offer constant attention to targeted accounts. Sales efforts are monitored to assure regular and on-going contact. Emphasis is placed on presenting and selling high volume products or those with margin potential. PSM realizes that its success in the market is based on the results of its people. We have a very aggressive and competent staff and are always looking to add quality people. PSM has a lucrative compensation package for its people that includes a retirement plan, medical benefit, annual bonus program, and competitive salary structure. Turnover is minimal. Support area includes the entire State of New Mexico, Southern Colorado and West Texas. Operator work is focused in the metro areas of Albuquerque, Santa Fe, El Paso, Lubbock, and Amarillo.